Choose a hosting platform that drives audience, traffic and engagement back to your website. Spoiler alert: It’s not YouTube. Video is affordable, but it's not going to be your least expensive method. Distribute your videos where real estate consumers go when they're looking for new places to live and work. In part one of our guide to getting a real estate video marketing program started, we discussed how to determine your video marketing strategy, why you need to commit to quality video and working with a professional videographer. Now, let’s shift the conversation to be a little more tactical. So your incredibly engaging, informative and entertaining videos are produced and ready to go. The next step is determine the right platform to host your videos. What I’m about to say goes against much of the advice you’ll typically read about video marketing. But it’s also one of the most crucial if you want to drive real business results from your video investment. Here’s the deal with YouTube. It sells ads. The longer a user stays on its site, the more ads it displays. The more ads it displays, the more revenue YouTube makes for Google (yes, Google owns YouTube). So it has a vested interest in keeping consumers on its site. This impacts your business in a couple of not-so-great ways. First, you have no control over what YouTube will show around your content. It shows ads and related videos near your product that it believes the user will be interested in; it’s based on the user’s Google profile, search history and viewing history. Second, YouTube has been statistically proven to do a terrible job referring traffic back to a publisher’s site. A January 2015 study by Shareaholic shows that YouTube, on average, refers 0.4 percent of viewers back to the publisher’s site. That means if your video is viewed 1,000 times on YouTube, you get, on average, four site visits. 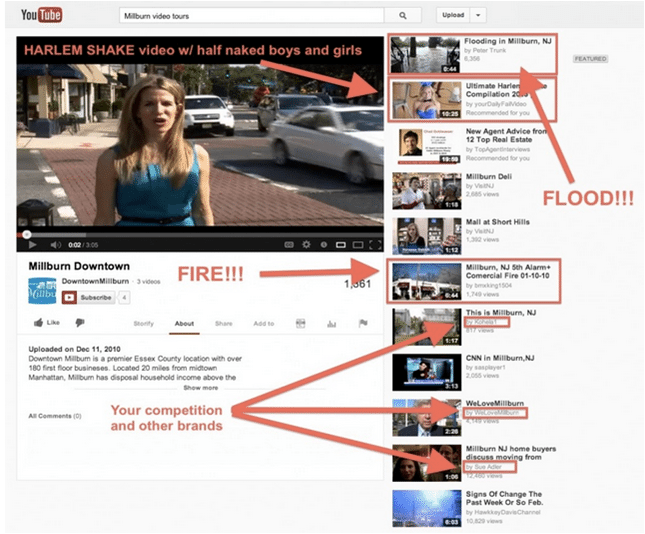 So if your content on YouTube is not driving traffic back to your website, where you can drive lead generation? Video isn’t going to be your least expensive marketing initiative. It’s certainly affordable, but not the least expensive. To truly get the most return for your investment, use a premium, business-grade video hosting solution. A premium solution sets your domain as the publisher of your content. That means, search engine traffic is directed back into your website, not a third party. And your video shares will direct traffic back into your website, not a third party. Do you want an easy way to see if your video platform will drive traffic into your site? Click the share button. Does the share link include your domain? Am I advocating to ignore YouTube? No. YouTube should still be part of your distribution strategy, discussed next, as it’s still a viable channel for building brand awareness. But if the end goal of your video investment is to drive audience, traffic and engagement on your own website, where you can maximize your lead generation efforts, then YouTube is not the answer. By now, your videos are created, and they’re uploaded and ready for massive levels of viewership. But how do you get that massive viewership? And specifically, how do you get that viewership in front of a real estate-specific audience? This is the distribution portion of your video marketing strategy. First, embed your videos throughout your site. Put brand videos on your homepage, agent videos on your bio pages, property videos on your listing pages — and feature them prominently. This will allow search engines to recognize your domain as the publisher of that content, where you will get all the SEO benefits and drive more organic search traffic into your website. Second, include click-to-play images in your email marketing communications. A study by GetResponse showed emails containing video get 96 percent higher clickthrough rates than non-video emails. Emails containing video get 96 percent higher clickthrough rates than non-video emails. Third, the big social media sites — Facebook, Twitter and YouTube — are all logical destinations to cast a wide net. They are the low hanging fruit. But are any of those places the ones real estate consumers go to first when they’re looking for new places to live and work? Rarely. Get your videos onto sites where highly qualified, high-intent consumers are searching. These include sites such as The New York Times, Wall Street Journal, Luxury Estate, and on the higher end of the market, Mansion Global. To piggyback off the first point above, a business-grade video hosting solution will give you all the tools you need to increase your audience, drive traffic back to your site and help your site engagement and lead generation efforts. Brian Andzejewicz is marketing manager at WellcomeMat.